Elevation: minimum 419 feet, maximum 485 feet. Area Habitat: open land 51.76%, forest 25.62%, wetland 14.26%, open water 0.52%. Open under statewide regulations for all squirrel, rabbit, quail, turkey and furbearer seasons. Deer: Open under statewide regulations for the archery, crossbow, December muzzleloader and youth gun seasons. Shooting hours are from one-half hour before sunrise to 2 p.m. Hunters may not enter the area until 4 a.m.
Less than two miles southeast of Boston. From Martha Layne Collins-Bluegrass PKWY, take Exit 10, go north on KY-52 about 1 mile after crossing Beech Fork. 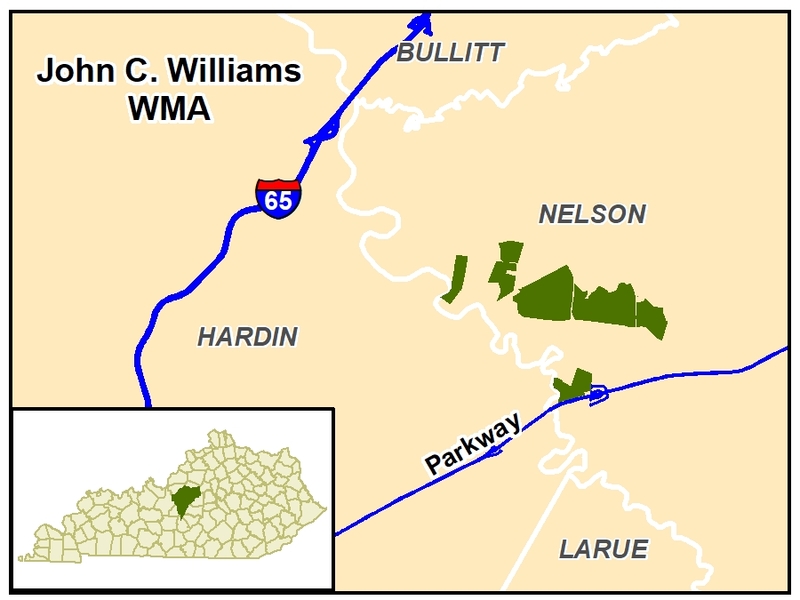 From I-65, take exit 105 for KY-61 toward Boston/Lebanon Jct. Turn onto KY-61 S, go 4.1 mi, turn onto KY-61 S/US-62 W/Old Boston RD. There is no public road access to the western most tract. The only access to that tract is by boat from the Rolling Fork River or by permission of adjacent property owners. Flat terrain with open fields, wetlands, moist soil unit. Fishing opportunity in Beech Fork. Owned by Kentucky Department of Fish and Wildlife Resources.